Located where the Assiniboine and Red rivers converge, Winnipeg is a vast and diverse city, situated in the heart of Canada, between both coasts. 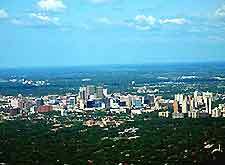 The capital of Manitoba (MB), Winnipeg is known for its hot summers and cold winter months, with many winter sports readily available around Winnipeg at this time of the year, including extensive skiing facilities. Home to many outstanding tourist attractions, museums, shops and restaurants, many of Winnipeg's most popular sights are concentrated in the center, within easy walking distance of each other. Located nearby, Lake Winnipeg is a popular day trip and features a number of stunning beaches, including the popular Grand Beach, a sun-drenched sandy area which is worth visiting during the summer. Hotels in the Winnipeg area are widespread throughout the city and appeal to all budgets and requirements, ranging from modern high-rise hotels to more historic accommodation. Often offering impressive city views, hotels in downtown Winnipeg, and in particular around Portage Avenue, are particularly popular due to their convenient proximity to many amenities. Further hotels in Winnipeg include many family-run bed and breakfasts dotted around the city, chain motels along the TransCanada Highway, central hostels, nearby camping grounds, and a number of hotels close to Winnipeg International Airport. 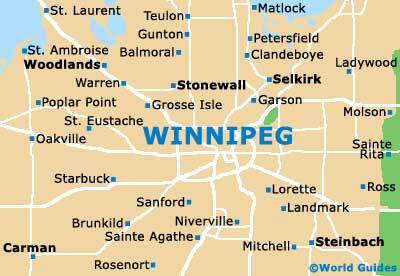 More information about Winnipeg Hotels. 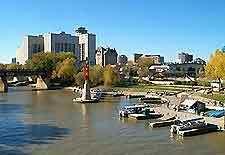 Tourism in Winnipeg is an expanding industry and tourists visiting the city are well catered for. The main tourist information outlets in Winnipeg are the Travel Manitoba Centers on Forks Market Road and at the Legislative Building on Broadway Avenue, and Tourism Winnipeg on Portage Avenue. With information about the main tourist attractions in Winnipeg, including nearby beaches, day trips and excursions, these tourism offices also offer guided walking tours of the city. Divided into numerous districts and communities, the main areas of Winnipeg are the Downtown District - home to many spectacular skyscrapers and tall structures; the Exchange District - a historical area with many renovated buildings; Forks Market - featuring many of the city's best restaurants and the popular Assiniboine River Walk; and Old Saint Boniface - across from the Red River, with a large French-speaking community. Also worthy of a mention, further districts in Winnipeg include Charleswood / Unicity - in the western suburbs of the city, with the Bomber Stadium and Winnipeg Arena; the Waterfront - a scenic, up-and-coming area lying on the northeastern side of downtown Winnipeg, on the western side of the Red River; and Transcona - an old area that has now gained individual city status. Winnipeg's main tourist attractions include regular guided walking tours - taking in the main sights and landmarks into central Winnipeg, led by experience, local guides; river cruises - offer regular trips along both the Red River and the Assiniboine River, connecting the main dock areas; Assiniboine Park Zoo - perfect for all the family, contains more than 1,000 animals, a Discovery Center, and an array of educational information; Centennial Concert Hall - standing in downtown Winnipeg, with many theatrical performances each year, including ballets, operas and concerts; the Royal Canadian Mint - an attractive building responsible for producing of all the coins used as currency in Canada; and the Winnipeg Convention Center - a top events venue hosting many large exhibitions, events and festivals. Winnipeg contains a large number of popular parklands and landscaped gardens, many of which offer seasonal activities, which include boating and fishing in the summer months, and ice skating, tobogganing and cross-country skiing during the winter. Some of Winnipeg's most notable parks include Fort Whyte, Oak Hammock Marsh Interpretive Center, Kil-Cona Park, King's Park, La Barriere Park and St. Vital Park, amongst others. 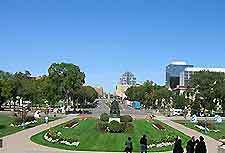 More information about Winnipeg Tourist Attractions and Winnipeg Landmarks and Monuments. Some of Winnipeg's main museums and art galleries include the Manitoba Museum / Museum of Man and Nature - one of the most popular museums in Winnipeg, with nine large galleries and a range of educational exhibits and artifacts; Manitoba Children's Museum - with family fun and many imaginative interactive displays, where all senses are stimulated; Western Canada Aviation Museum -, Canada's second-largest museums of its kind, located next to Winnipeg International Airport, with many historic aircraft, aircraft exhibits and aviation information; Winnipeg Art Gallery (WAG) - one of the country's oldest art galleries, known for its impressive Inuit art works and world-class exhibitions; Bayat Inuit Gallery - home to over 2,000 works of art, many of which are by famous Canadian artists; and Gallery 757 - specializing is works by local artists from Winnipeg and all over Manitoba. More information about Winnipeg Museums and Winnipeg Art Galleries. Tourist attractions located nearby Winnipeg include Birds Hill Provincial Park - located just a short drive from downtown Winnipeg, with forests, walking trails, wild turkeys and a small beach; Selkirk - a nearby town, home to the Marine Museum of Manitoba and best known for its varied fishing; Dugald - a small and appealing town to the east of Winnipeg, featuring an impressive costume museum; Grand Beach - just one of many spectacular beaches lining Lake Winnipeg's eastern shore; Lower Fort Garry - a restored fort built in the 1830s, situated on the banks of the Red River; and the Oak Hammock Marsh - a vast nature conserve close to Winnipeg, offer with enormous numbers of birds, particularly waterfowl. More information about Winnipeg Attractions Nearby.